Duration : 65 x episodes - Compilation: 13 x 44 min. | Single titles 11 min. 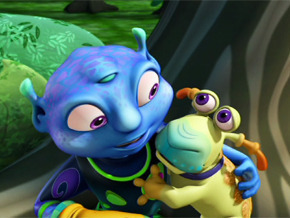 Jack is a fun‐loving alien explorer whose coolest discovery yet is the amazing "Planet Earth"! With the help of his alien dog Rocket and his robotic assistant CHIP, he sets out on a series of fun and daring adventures to learn all about this strange newplanet! Showing him the ropes are his three new friends: a nine‐year‐old boy named Nico, his little sister Sam, and their slacker pal Yoki. Together they help Jack (and us!) understand how things work here on Earth...and beyond! Jack is an animated series consisting of 52 eleven‐minute episodes, perfect for children from six to nine years old. By mixing humour, adventure, and science, the series helps children discover amazing new facts about the world and space around us, all while following the exciting adventures of our hero Jack. * 2012 Gémeaux award winner - Best digital project in a children's or youth series.